Politician. Democrat. Born: October 14, 1871, Montgomery County, Indiana. Died: February 9, 1928. Served in U.S. Senate: March 4, 1913, to March 4, 1919. William Howard Thompson was born October 14, 1871, to John Franklin and Dora Emma Thompson in Crawfordsville, Indiana. The family moved to Kansas when Thompson was eight and lived on a farm in Nemaha County. He was educated in public schools in Seneca and graduated from high school in 1886. In his late teen years, Thompson studied law in the office of his father who himself was a district judge at Sabetha. He taught one term of school in Brown County. In 1889 he was appointed deputy treasurer of Nemaha County when he was only 18 years old. 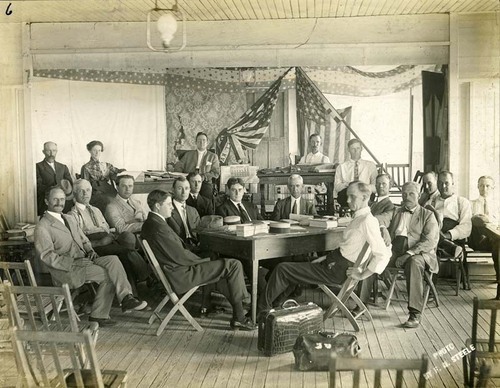 In 1891, he was appointed the official court reporter for the 22nd Judicial District. In 1894 he was officially admitted to the bar. For three years Thompson entered a partnership with his father and practiced law in Seneca. On August 29, 1894, he married Bertha Feldt, daughter of lieutenant-governor Andrew J. Feldt. The couple raised three children: Thelma Bertha, Wilbert Feldt, and William Howard Thompson. Thompson was appointed to the position of clerk of court of appeals in January 1897 and served until 1901. During this time he improved the condition of the office and changed it from a deficit inducing office to one that yielded revenue to the state. After his term was over, he practiced law briefly in Iola. In 1905 he moved to Garden City and served for six years as a judge of the 32nd Judicial District during which his decisions were characterized as non-partisan and fair. In 1912, he was nominated for the U.S. Senate for the Democratic ticket. In the following election he received the largest popular vote as well as the largest legislature vote at the time with all major political parties voting unanimously for him. Thompson entered the senate and identified himself as a progressive promoting reform. During his single term as a Senator he supported both women's suffrage as well as national prohibition. He was also the author of numerous articles on judicial reform: "Jack Rabbit Justice," "Tricks of the Trade," and "Impaneling a Jury Speedily in Criminal Cases." Thompson served as senator from 1913-1919. When his term was over, he returned to Kansas and practiced law in Kansas City. In 1923, he moved to Tulsa, Oklahoma, where he was a member of the Thompson & Thompson law firm. He returned to Washington, D.C. in 1927 where he remained for the rest of his life. Thompson passed away February 9th, 1928, in Washington, D.C. He was buried in Topeka. "William Howard Thompson." The National Encyclopaedia of American biograpny. (1916) vol. 15. p. 57. "Who's who in America and Kansas and Kansans." vol. 3, p. 567.